Less than one month before a gunman went on a bloody rampage in suburban Tucson, killing six and wounding 13, a similarly gruesome scene played out in a dark canyon just outside the city. Bandits armed with AK-47s attacked a group of U.S. Border Patrol agents, including Brian Terry, a three-year veteran of the force, who was shot in the back and killed. Hundreds of law enforcement officers, friends and family of Terry gathered Friday for a memorial service at a Tucson sports arena. And some voiced frustration that justice for their fallen comrade hasn't come fast enough. "The FBI is being completely mum on where the investigation is at," said National Border Patrol Council President T.J. Bonner in an interview. "We're pressing to get some answers not only for our organization but the family." Bonner said the lack of details on the investigation was particularly troublesome in light of federal investigators' robust response to the shooting of U.S. Rep. Gabrielle Giffords at an event two weeks ago. "It's incumbent upon the FBI to be more forthcoming about what they know and what they don't know," he said. Federal law enforcement officials contacted by ABC News said four suspects are in custody, detained immediately following the shooting Dec. 15, but that a fifth suspect remains at large. Some observers believe he likely escaped to Mexico. "We've got to hunt them down and put them in jail, whether they're drug traffickers, alien smugglers or, in this particular case, people who shoot and kill border patrol agents," said Immigration and Customs Enforcement Director John Morton. An FBI spokesman declined to discuss the ongoing investigation or identify the names of the men in custody but said that the suspects were being held on "immigration charges." No murder charges have been filed in Terry's death. "There was so much attention focused on one deranged individual that went berserk in a residential area in Tucson, and yet you have gangs of armed bandits roaming around in canyons relatively close to populated areas and there doesn't seem to be the same outrage over that," said Bonner. At the memorial service Friday, U.S. Customs and Border Protection commissioner Alan Bersin affirmed the urgency of resolving challenges to U.S. border security and suggested the agency would bring Terry's killers to justice. "We will finish the job that Brian participated in, the reason he was in those canyons west of Nogales," Bersin said. "We are determined to restore the rule of law to the U.S.-Mexico border." 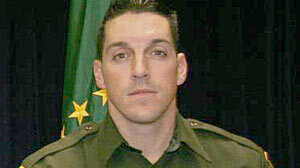 But for now, members of Brian Terry's family say they simply want answers. Carolyn Terry, Brian's stepmom, said she only received a rough picture of what happened from a U.S. Customs and Border Protection official who called to notify them of Brian's death. "We don't know when exactly he died," she said of Brian, who had been airlifted from the scene to a local hospital. "We have so many questions." Brian Terry, 40, a member of the Border Patrol's elite tactical team, had been on patrol for illegal immigrants and drug smugglers in an area known as Peck Canyon, north of Nogales and south of Tucson, the night he was killed, according to several accounts. The corridor is known as a funnel for illicit immigrants, drugs and weapons. And as border security has tightened in recent years, officials say, the area has become more dangerous and rife with bandits. "The public is largely unaware of how dangerous and out of control it is along the Southwest border," said Bonner. "Part of that is because they hear politicians telling them that things are more secure now than at any time in our nation's history. That's simply not true; it's not fact." Homeland Security Secretary Janet Napolitano has repeatedly said that the Southwest border is as secure now as it has ever been in the nation's history. Several statistical measures corroborate Napolitano's assertion, but the danger and illicit flows persist. Terry's murder is the first death of a Border Patrol agent in the line of duty since July 2009, when Agent Robert Rosas was killed on patrol along the border in southern California.